Been doing a lot of research on Baba Yaga lately. Not only is she part of this crazy idea I have for a bunch of linked witch adventures, she has been a key, if background, figure in my games for years. This is the official/unofficial continuation of the famous S series. I picked this one up because it was about Baba Yaga and my kids have gone through all the S modules now. 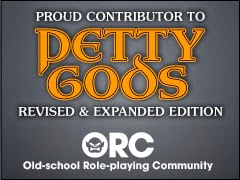 This module is for 2nd Ed AD&D and from the earlier days of that system. I "feels" like a late 80s adventure instead of a mid 90s one (1995). 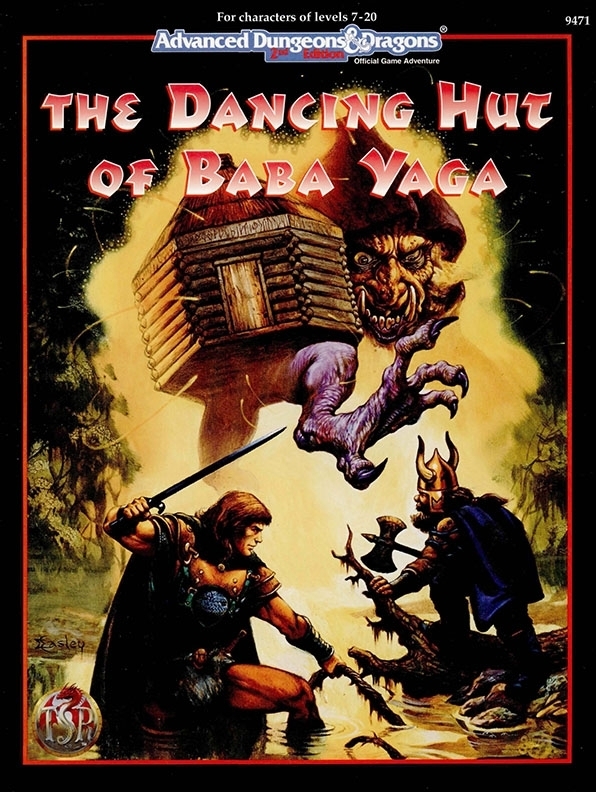 I think in part this has to do with it's origins and that the Roger Moore Dragon magazine (March 1984) article about Baba Yaga's hut was still on people's minds at the time. This adventure is more plot driven than the other S series adventures. Baba Yaga is more of a defined character than say Acererak or Drelnza. In fact she is presented in much of the same manner as Strahd was in Castle Ravenloft. Though there is the assumption that the PCs wont be so stupid as to attack her. Could the right group do it? Sure, but that is not the fun of this adventure. The fun here is investigating her magical hut and finding things that might be unique in your world. The Hut itself is almost a mini-campaign world, complete with it's own rules of magic and control over the daylight and nighttime hours. Each level of the hut is designed for different level of characters. It does recall some of the "funhouse" dungeons of the S series in terms of what is being offered but there is some logic applied to most of the rooms. Others unfortunately feel like filler. It is a fun adventure, but not one that really lives up to the S legacy or the potential of Baba Yaga herself. This 67 page book (minus covers, OGL and table of contents) is simply packed full of material for playing Baba Yaga. First we have some background on the witch herself including stats. We are also treated to a number of NPCs that have entered the witch's stories over the years. The book is written for D&D 3.0 edition, but the stats are so few that it could be easily used with any edition, or any game really. And you will want too because there is a lot here. This is book has guides to her hut, the lands that surround it, what happens to those lands and those that come into them. There is even tips on role-playing the witch. This really is an indispensable guide. 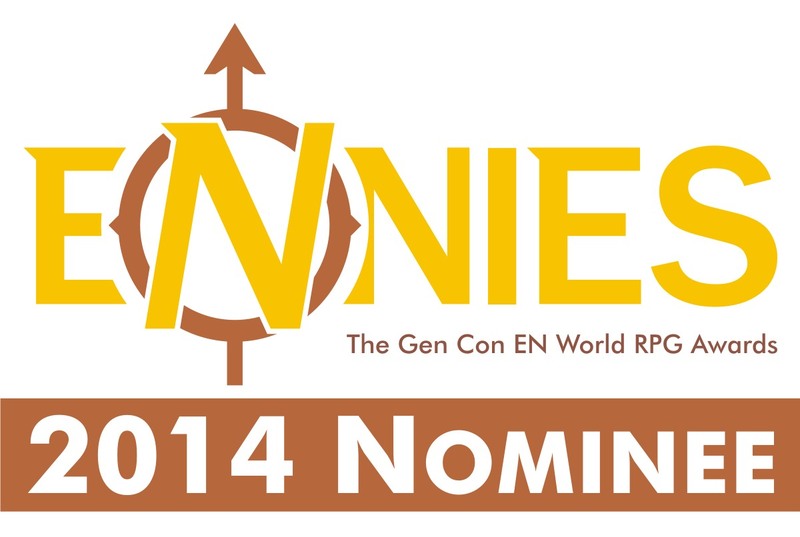 For 4th Edition D&D. Good little Baba Yaga workup for any level/tier of play. Lots of attention to the myths of Baba Yaga were paid attention to, but their could have been more. The art is only ok, and I would have liked to have seen more of the magic items and stories surrounding her. A supplement for the Little Fears Nightmare Edition game. Little Fears has always been one of the games people talk about more than play in my opinion. Though that could just be my experience about not getting to play it as much as I like. This book is 15 pages, but only about 9 of it is content. Don't get me wrong, the art is great and really sets a good tone. Baba Yaga's children are a "Creeper" or a child turned into a monster. The monster in question of course is Baba Yaga. I love the idea for LFNE, but I REALLY want to try this out in D&D and other games too. The rules of Little Fears are easy enough that conversion is really a breeze. This is not an adventure or a book but a papercraft model. One of the first I have gotten from Fat Dragon. This was an easy-ish little model to build and it really looks quite nice. I love being able to display this with the minis while we are playing. When we are done with our Baba Yaga adventures then this is going on my shelf with my little witch minis. A lot of games take on faerie tales. A lot of games deal with the lands of faerie too. But this is one of the very, very few games that takes place in and about the land of faerie. Seven Leagues is a simple game (mechanics wise) for playing in all sorts of faerie tale situations. I say it is simple, only because the mechanics are. Roll a d12, add or minus appropriate modifiers and get a 13 or better for a success. 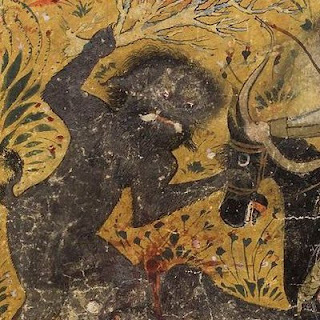 There are a few attributes, called Virtures (Hand, Heart and Head) and the rest are like qualities or Charms (in this game), "Strong as a horse", "Tough hide", "can't be hit" and so on. You can play an ogre, a sprite, a magical tree or even a talking animal. You also take a negative "Taboo". Your high concept or class as it were is called an Aspect. Browsing through this beautiful 126 page pdf I saw influences from Greek myth, Grimm Fairy Tales, folklore from all over Europe and elements they all have in common. There is a heavy role-playing and story-telling element to this I really like. You are encouraged, by way of your character creation, to get invested in your character. Honestly this is a great game to teach kids or use it as a primer on how to run a Faerie-based game for any other system. This was written for the Fortune's Fool RPG, but is written in such a way that it can be easily adapted to any game. 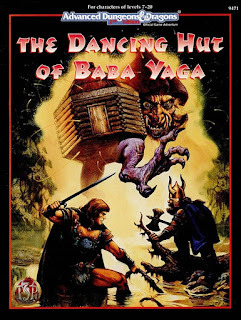 This gave me some great ideas for using the D&D version of Baba Yaga's hut. Plus I also want to check out the Fortune's Fool game as well. Wow...that is a lot of Baba Yaga. I had no idea so many books had been inspired by the Little Grandmother. Thanks for the list!